Fregate Island Private is the 7th largest granitic island in the inner islands group of the Seychelles archipelago and operates as an exclusive resort that integrates luxury tourism with the conservation of the natural environment. The island lies at 04°35´19´´S and 55°56´55´´E, 55 Kilometres east of Mahé, with its highest point, Mont Signal, situated 125 m above sea level. At 219 hectares in size, it is a haven for biodiversity, home to a large variety of rare and endemic species. During the early 1900’s the island was used for spice and copra production, resulting in most of the islands native flora being replaced with species such as coconut, cinnamon, cashew, cocoplum, mango, vanilla, and its support/shade plant Sandragon. Despite this, the island still retained many important plant and animal species endemic to Frégate Island and the Seychelles, including the Seychelles Magpie Robin and the Giant Tenebrionid Beetle. A biodiversity and conservation programme was put in place during the 1990’s with the aim to conduct environmental research and monitoring of most vulnerable species on the island. This included the ongoing habitat restoration programme on the island that makes use of native species propagated in the islands tree nursery to restore the islands habitat to its natural state. Fregate Island hosts nesting populations of A. tenuirostris, G. alba and P. lepturus. Breeding censuses for A. tenuirostris have been carried out yearly during the South-East Monsoon since 2010, and this will be expanded to include G. alba as of 2013. The island is also visited throughout the year by numerous migratory shore and seabird species. Little Fregate is an islet of approximately 2.3 hectares lying 3 km South-West of Fregate Island. The islet is shaped by large granite boulders along with coral formations and is an important breeding ground for seabirds. 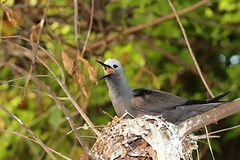 Little Fregate hosts breeding colonies of five seabird species not found on Fregate Island itself. These are S. anaethetus, S. fuscata, A. stolidus, P. pacificus and P . lherminieri. Comprehensive monitoring has not been carried out in the past, although this is planned for 2013.